Itanagar: Five mutilated bodies and the wreckage of the helicopter carrying Arunachal Pradesh Chief Minister Dorjee Khandu were found Wednesday near the Jang waterfalls in Tawang district, exactly 96 hours after they went missing, officials said. 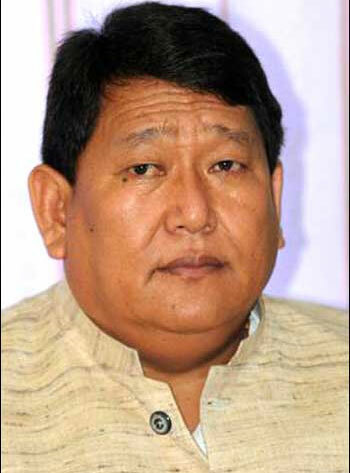 A relative and panchayat leader of Arunachal Pradesh Chief Minister Dorjee Khandu's Assembly constituency has identified his body, according to Union Minister for Development of North Eastern region B K Handique. He told reporters that the panchayat leader Thupten has identified the body of 56-year-old Dorjee while the other four bodies have been charred beyond recognition. The minister, however, said that only after the divisional commissioner takes charge of the body and the formalities are completed, they could officially confirm news about Dorjee. Asked about the successor to Dorjee, he said, "Everything will be taken care of." The single engine four-seater Pawan Hans helicopter with Dorjee and four others on board went missing soon after taking off from Tawang on Saturday. Besides Khandu, others on board were pilots Captain J S Babbar, Captain T S Mamik, Khandu's security officer Yeshi Choddak and Yeshi Lhamu, sister of Tawang MLA Tsewang Dhondup. Inclement weather had prevented teams from carrying out aerial searches. External Affairs Minister S.M Krishna on Wednesday condoled the sad demise of Arunachal Pradesh Chief Minister Dorjee Khandu, who has been killed in a chopper crash in Lobothong near Tawang District. In a statement, Krishna said: "I am deeply pained to receive confirmation of the tragic and untimely demise of a great son of India and the Chief Minister of Arunachal Pradesh Dorjee Khandu." "He was dedicated to the cause of improving the quality of lives of the people of the Indian State of Arunachal Pradesh," he added. He further said: "In his (Khandu) death, the state and country has lost a visionary administrator and an excellent human being. I would like to convey my heartfelt condolences to members of his family and friends. TV reports indicate that the crash site has been located near Jang waterfall in Tawang. Appealing to the media to not speculate till the official confirmation, Home Minister Chidambaram said none of the bodies had been identified. "The crash site has been located, some bodies sighted. Let's wait for more information," the home minister told reporters here. Search teams spotted the wreckage and the bodies in remote and inaccessible Lobotang area around 10 a.m. at an altitude of 10,000 ft. The area is surrounded by steep mountain ranges and is thickly forested. The bodies are likely to be lifted to the first accessible point and then brought to Itanagar later in the day, officials said. Rescue teams could take three to four hours to bring the bodies to the first accessible point on foot. The rugged and difficult terrain with rains and heavy snow is affecting the progress of the rescue workers. The Pawan Hans AS350 B-3 helicopter had taken off from Tawang at 9.50 a.m. Saturday. The last radio contact with the ground was about 20 minutes after take off as it flew over the Sela Pass along the Chinese border perched at an altitude of 13,700 feet. Six Indian Air Force helicopters Wednesday morning began an aerial survey along the dizzy heights of Sela Pass for the rescue and search mission. Congress legislator Tsewang Dhondup's younger sister, Yeshmi Lamu, was the lone woman occupant in the helicopter. She was in the helicopter with the chief minister for a medical check-up in Itanagar. The helicopter had two pilots and three passengers on board, including the chief minister and his personal security officer. Yeshmi Lamu was the third passenger. The Arunachal Pradesh government had announced a cash reward of Rs.1 million to anyone who could provide information about the missing helicopter. On Wednesday, six Indian Air Force helicopters did an aerial survey along the dizzy heights of Sela Pass in Arunachal Pradesh. Six helicopters - two each of the Mi-17, Cheetah, and Cheetak - took off from bases in Tawang and Tezpur in Assam at 5.05 a.m. Wednesday for rescue and search mission, IAF spokesperson Ranjeeb Sahoo said. The Pawan Hans AS350 B-3 helicopter carrying the chief minister and four others went missing after it took off from Tawang at 9.50 a.m. Saturday. The last radio contact with the ground was about 20 minutes after take off as it flew over the Sela Pass along the Chinese border perched at an altitude of 13,700 feet.